Ophir, formerly known as Blacks No 1 or Blackton, was a thriving gold mining town established in the 1860s. In 1875 the settlement, complete with stores, hotels, banks, churches, hospital, police station and school, was named Ophir after the Biblical place where King Solomon obtained gold for the temple in Jerusalem. In October 1886 a new Post Office of schist masonry with plaster quoins and window dressings was built by stonemason Edward Booth, replacing a smaller operation in Ophir. 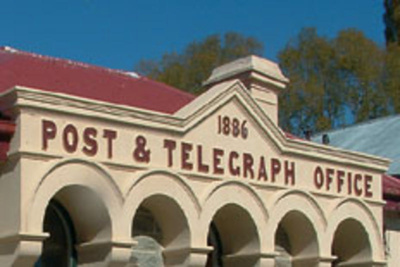 In 1976 the Post Office was taken over by the New Zealand Historic Places Trust (now Heritage New Zealand Pouhere Taonga) and restored, and still operates postal services for three hours each weekday morning. Its interior remains largely unchanged from the time of its construction. 17 4051 79021 "alexander don" "balance scales" bannockburn "cadw mi gei" "cadw mi gei posb money box" "carnegie and layton" "city bank" "colonial and foreign parcelpost" "donald mcrae" "fung wut chyun" "g a tomlison" green key lacquered "lick telescope" "main street" "maltese cross" "mr e drake" "now i had one of these at opoutere maori school 1964" ophir "ophir post office" "patent no 31664482154" "piggy bank" posb "post box" "post office issue" print red scales school sluicing "w j stafford"